Now we come to the final verse of the eighth chapter of the cream of all the Upanishads, the Gī topaṇiṣad, Bhagavad-Gita. Kṛṣṇa enunciates this verse as a recap, a summary of the theme he has developed since beginning to focus on the path of Bhakti-Yoga (the devotional path) in the beginning of Chapter Seven. So this one verse compresses all the wisdom of the entire 7th and 8th chapter. Please hear it with reverence and care! A person who accepts the path of devotional service is not bereft of the results derived from studying the Vedas, performing austere sacrifices, giving charity or pursuing philosophical and fruitive activities. Simply by performing devotional service, he attains all these, and at the end he reaches the supreme eternal abode. Before undertaking the honor of attempting to elucidate Prabhupada’s commentary on this verse, I beg your full attention for a few more minutes as I outline the overall meaning of this verse. There are many paths to get to the absolute goal of self realization. Kṛṣṇa outlines the several most significant of these spiritual paths though the chapters of Bhagavad Gita. The path of devotion to Godhead, however, bhakti-yoga, holds a paramount place of importance. Bhakti yoga, perhaps, is not so much a “path” to self-realization as it is the actual vehicle of self realization. There are many roads I can take to get to the grocery store, but if I don’t have a vehicle, none of them will actually get me there. Similarly there are so many paths to get to God-realization / self-realization – but without the vehicle of bhakti (devotion), none of the paths are effective! This is not a sectarian statement or an attempt to champion one form of spirituality over another so much as it is a reliable fact borne out by logical common sense. Given: The absolute truth is infinite. Given: Our current powers of perception and comprehension are not infinite, they are finite. Conclusion 1: Therefore we cannot gain god-realization by our own powers. Conclusion 2: Realization of god is possible, not by our own powers, but by the arrangement of the infinite only. The final conclusion drawn from the above is that God can only be realized when s/he wants to be realized. When God wants to be realized, s/he makes the impossible possible and makes us capable of comprehending what is beyond finite comprehension. The answer is simple and natural. You do not want to reveal your intimate secrets to a person you don’t trust. We reveal our intimate secrets only to those how love us sincerely and have our best intentions in mind. The main point is that realization of God is not possible without God’s willing revelation of his infinite being. God is willing, fully willing, eager actually, to reveal himself fully and intimately to us – and is simply waiting for us to be truly and purely interested in obtaining that full understanding of the Personality of Godhead, which arises as a result of developing love for Godhead. Therefore it is the purest of logic to conclude in a most non-sectarian and unbiased manner that without bhakti (devotion, love for Godhead), no progress can be made whatsoever on any spiritual path. This is why elements of bhakti such as prayer and worship are integrated into other paths such as religion, philosophy, and yoga. The point is that not everyone, in fact relatively almost no one, is really ready to embrace Godhead so directly, purely and wholeheartedly as the path of bhakti-yoga enjoins. Therefore other paths are meant to prepare the greater bulk of the masses to gradually purify their selfish ego, the force which detracts from the interest in selfless divine love. The many paths of self-realization are meant to gradually qualify a person to take to the path of pure devotion, bhakti-yoga. After thousands of lifetimes of cultivating progress in ethics, morality, religion, science, philosophy, yoga, and strict meditation finally one takes a birth where one is able to directly embark upon the path of bhakti-yoga. In my own supreme abode. In summary, every other spiritual path depends on the bhakti sprinkled into it’s mixture – but bhakti stands alone, a self-sufficient path requiring nothing outside herself. This really is not just a summary of Chapters seven and eight, it is a summary of the whole Gita. And since the Gita is a summary of all the Upanishads, which are themselves summary elucidations of the entire Veda – this fact is actually a summary of the entire Veda. Thank you so much for giving your full and careful attention to this flawed attempt of mine to express the meaning of the Verse. I would like to keep ahold of your thoughts for a few moments more, as we examine the commentary on this verse of Bhagavad Gita given by our Srila Prabhupada. One has to study the Vedas under the guidance of the spiritual master and undergo many austerities and penances while living under his care. A brahmacārī has to live in the home of the spiritual master just like a servant, and he must beg alms from door to door and bring them to the spiritual master. He takes food only under the master’s order, and if the master neglects to call the student for food that day, the student fasts. These are some of the Vedic principles for observing brahmacarya. After the student studies the Vedas under the master for a period from five to twenty years, he may become a man of perfect character. Study of the Vedas is not meant for the recreation of armchair speculators, but for the formation of character. After this training, the brahmacārī is allowed to enter into household life and marry. When he is a householder, he has to perform many sacrifices so that he may achieve further enlightenment. He must also give charity according to the country, time and candidate, discriminating among charity in goodness, in passion and in ignorance, as described in Bhagavad-gītā. Then after retiring from household life, upon accepting the order of vānaprastha, he undergoes severe penances — living in forests, dressing with tree bark, not shaving, etc. By traversing all the aforementioned spiritual paths, one becomes fit to enter life’s fourth and final aśrama – the sannyāsa aśrama – which follows complete renunciation and cultivation of scientific philosophical understandings (jñāna-yoga). By carrying out the orders of brahmacarya, householder life, vānaprastha and finally sannyāsa, one becomes elevated to the perfectional stage of life. Some are then elevated to the heavenly kingdoms, and when they become even more advanced they are liberated in the spiritual sky, either in the impersonal brahmajyoti or in the Vaikuṇṭha planets or Kṛṣṇaloka. This is the path outlined by Vedic literatures. The sanyassi’s engage in the type of meditation and yoga outlined in the Sixth Chapter of Gita, and referred to again here in the Eighth. By this they can elevate themselves to various posts. This is a recap of what we have learned in this chapter. One significant thing to learn here is that all of the paths of spiritual life are wrapped into the varnāśrama dharma social system. It is significant to understand that this social system is not important and not required for any person who can take wholeheartedly and directly to the spiritual practices of Bhakti Yoga. This social system is only important for individuals who cannot do so. Even individuals who can take directly to bhakti-sādhana may not be able to do so constantly throughout every stage and condition of their lives. At such times even a bhakti yogi may recourse to the second-tier of their spiritual lives and take shelter of this religious social system: varṇāśrama-dharma. The beauty of Kṛṣṇa consciousness, however, is that by one stroke, by engaging in devotional service, one can surpass all the rituals of the different orders of life. By taking directly to loving Kṛṣṇa, one eliminates any need for any other method of spiritual progress. Thus for the devotees, there really is no such thing as castes and stations of varṇa and aśrama. This is why traditionally the bhakti-yogi in a realized state enters a lifestyle loosely called bābājī where he does not wear any caste designation like a sacred thread or any symbol of station such as the saffron of a sanyassi. In modern times, since the predecessor of our Srila Prabhupada – HDG Bhaktisiddhanta Sarasvati Prabhupada – an alternative has arisen where the bhakti-yogi does adopt caste and station symbols – taking sacred thread and saffron/staff of sanyassa, etc. 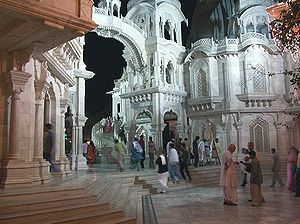 According to what I understand, this alteration to tradition was made for two valid reasons, (1) To counteract the misuse of the brahmana caste and the sanyassa ashrama by putting truly spiritual persons into these stations; and (2) in preparation for spreading Bhakti-Yoga to a worldwide venue, with very little previous development in the various preparatory spiritual paths – who would therefore often require support from a religious social backdrop. Nevertheless, the designation of oneself as a “devotee” is far, far, far, far more important than the designation or non-designation one may adorn as a shudra, vaishya, kshatriya, brahmana, or brahmacari, grihastha, vanaprastha, or sannyasi. My personal conviction is that when this truth is not fully embraced, there is a distasteful distortion of priority and emphasis which infects the otherwise pristine bhakti-yoga movements in this world currently. My śikṣa-guru Aindra Das “Babaji” was pressed to conform to the ISKCON “varnashrama-dharma” social norms and conventions. He completely resisted and refused. He refused to wear clothing designating any ashrama or varna, and when interrogated by social authority figures he declared himself to be “A brahma-astra vana-yassi” – Braha(cari),( Grih)astha, vana(prastha), (san)yassi. This is one of the many reasons I love him and respect him as a guru. My even more prominent śikṣa and dīkṣa guru, HH Dhanurdhara Swami, wears saffron, a sacred thread and is a brahmana and a sanyassi. However, I have not observed, ever, that he deeply identifies with any of these superficial designation to any level commensurate with his self-identity as a servant of his guru, Srila Prabhupada, on the path of unadulterated Bhakti Yoga. In my humble opinion therefore, both approaches are honorable. But to deeply identify as something other than a devotee, even if it has a Sanskrit name, is a deep illusion. Let’s return to Prabhupada’s commentary. The words idaḿ viditvā indicate that one should understand the instructions given by Śrī Kṛṣṇa in this chapter and the Seventh Chapter of Bhagavad-gītā. One should try to understand these chapters not by scholarship or mental speculation but by hearing them in association with devotees. Chapters Seven through Twelve are the essence of Bhagavad-gītā. The first six and the last six chapters are like coverings for the middle six chapters, which are especially protected by the Lord. If one is fortunate enough to understand Bhagavad-gītā — especially these middle six chapters — in the association of devotees, then his life at once becomes glorified beyond all penances, sacrifices, charities, speculations, etc., for one can achieve all the results of these activities simply by Kṛṣṇa consciousness. If I understand what the Gita is saying, I will become liberated as a bhakta. How to understand it? Not like a scholar pulling it apart as if he were superior to the knowledge, a laboratory teacher dissecting a lowly frog. No! I can only understand the Gita, which contains infinite wisdom, when the Gita itself reveals itself to me. Therefore only by studying the Gita with my heart wide open can I really know and absorb it’s meaning and impact. What is the real meaning of Gita? The real meaning is, the ultimate duty and nature of every living thing is to be absorbed in a loving relationship with Godhead. The Gita presents this message most directly in chapters 7-12, which are the central chapters. One keeps one’s most valuable possessions deep in his private quarters, surrounded by doors, walls and locks on all sides. Thus the primary message of the gita is protected in it’s middle chapters. One who has a little faith in Bhagavad-gītā should learn Bhagavad-gītā from a devotee, because in the beginning of the Fourth Chapter it is stated clearly that Bhagavad-gītā can be understood only by devotees; no one else can perfectly understand the purpose of Bhagavad-gītā. One should therefore learn Bhagavad-gītā from a devotee of Kṛṣṇa, not from mental speculators. This is a sign of faith. When one searches for a devotee and finally gets a devotee’s association one actually begins to study and understand Bhagavad-gītā. By advancement in the association of the devotee one is placed in devotional service, and this service dispels all one’s misgivings about Kṛṣṇa, or God, and Kṛṣṇa’s activities, form, pastimes, name and other features. After these misgivings have been perfectly cleared away, one becomes fixed in one’s study. Then one relishes the study of Bhagavad-gītā and attains the state of feeling always Kṛṣṇa conscious. In the advanced stage, one falls completely in love with Kṛṣṇa. This highest perfectional stage of life enables the devotee to be transferred to Kṛṣṇa’s abode in the spiritual sky, Goloka Vṛndāvana, where the devotee becomes eternally happy. This is an enumeration of the nine stages of progress in bhakti yoga. 1. First one requires “faith” – which is an open heart. 2. Next one requires “Guidance” – so the open heart leads one to learn the path of bhakti – revealed in Bhagavada Gita and other places – under the guidance of those who are more experienced on that path. 3. “Practice” – Under guidance, we actually study the Gita and put it into practice. 5. “Fixation” – When the main bulk of our obstacles are dissolbed our study and practice of bhakti becomes very deep and sincere, it therefore becomes fixed and unshakable. 6. “Taste / Relish” – By studying and practicing bhakti with deep sincerity we relish great spiritual bliss. 7. “Addiction” – we desire to taste that bliss always and everywhere. As a result, we attain the 10th stage, the goal, which is to be with Kṛṣṇa, face-to-face in his most intimate setting, Goloka Vrindavana. This is the sum and substance of the Eighth Chapter, the entire Gita, all the Upanishads, all the Vedas, and thus the entire human pursuit of happiness. Thank you so much for entertaining my extremely long discussion on this verse. Previous Self-Realization in Krsna Consciousness is EASY?? ?